For the 2002 film adaptation, see The Lord of the Rings: The Two Towers. For other uses, see The Two Towers (disambiguation). The Two Towers is the second volume of J. R. R. Tolkien's high fantasy novel The Lord of the Rings. It is preceded by The Fellowship of the Ring and followed by The Return of the King. The Lord of the Rings is composed of six "books", aside from an introduction, a prologue and six appendices. The novel was originally published as three separate volumes due to post-World War II paper shortages and size and price considerations. The Two Towers covers Books III and IV. Tolkien wrote, "The Two Towers gets as near as possible to finding a title to cover the widely divergent Books 3 and 4; and can be left ambiguous." At this stage he planned to title the individual books. The proposed title for Book III was The Treason of Isengard. Book IV was titled The Journey of the Ringbearers or The Ring Goes East. 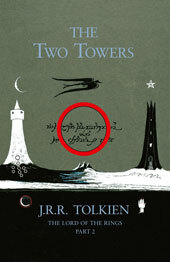 The titles The Treason of Isengard and The Ring Goes East were used in the Millennium edition. In letters to Rayner Unwin Tolkien considered naming the two as Orthanc and Barad-dûr, Minas Tirith and Barad-dûr, or Orthanc and the Tower of Cirith Ungol. However, a month later he wrote a note published at the end of The Fellowship of the Ring and later drew a cover illustration, both of which identified the pair as Minas Morgul and Orthanc. In the illustration, Orthanc is shown as a black tower, three-horned, with the sign of the White Hand beside it; Minas Morgul is a white tower, with a thin waning moon above it, in reference to its original name, Minas Ithil, the Tower of the Rising Moon. Between the two towers a Nazgûl flies. As Aragorn searches for Frodo, he suddenly hears Boromir's horn. Aragorn finds Boromir mortally wounded by arrows, sitting with his back against a great tree, surrounded by many slain orcs. Before Boromir dies, Aragorn learns that Saruman's Uruk-hai soldiers have kidnapped some of the hobbits, in spite of his efforts to defend them; that Frodo had vanished after Boromir had attempted to take the Ring from him; and that he truly regretted his actions. In his last moments, Boromir charges Aragorn with defending Minas Tirith from Sauron. With Legolas and Gimli, who had been fighting Orcs by themselves, Aragorn pays his last tributes to Boromir and sends him down the Great River Anduin on a funeral boat, the usual methods of burial being impractical. Aragorn, Legolas, and Gimli later resolve to follow the Uruk-hai captors and rescue Merry and Pippin. Aragorn, Gimli, and Legolas come across the Riders of Rohan led by Éomer, nephew of King Théoden. The trio learn that the horsemen had attacked a band of Orcs the previous night, and that they had left no survivors. However, Aragorn is able to track a small set of prints that lead into Fangorn, where they see an old man who disappears almost as soon as they see him—they assume him to be Saruman. Their horses bolt away, which they also assume to be the work of Saruman. Merry and Pippin, taken captive by the Uruk-hai, learn that one of the orcs from Mordor, Grishnákh, knows about the ring and believes it to be on one of them. The fact that the Uruk-hai and the Mordor orcs are in collusion proves to be a disquieting piece of information. When the Uruk-hai are attacked by the horsemen of Rohan, called the Rohirrim or "Riders of Rohan", Merry and Pippin escape Grishnákh, who has taken them out of the camp but is killed by a Rider. They then go into the nearby Fangorn Forest, where they encounter the giant treelike Ents. The Ents resemble actual trees, except they are able to see, talk, and move. These guardians of the forest generally keep to themselves, but after a long contemplation on whether the Hobbits were friends or foes, their leader Treebeard takes them in as friends. The hobbits are given some of the nourishment of the Ents, Ent-draught, which causes them to grow. Treebeard then calls a council of the Ents, or an Entmoot. There, Treebeard and another Ent named Quickbeam persuade the Ent council to oppose the menace posed to the forest by the wizard Saruman, as suggested by Merry and Pippin, as Treebeard realizes that Saruman's minions have been cutting down large numbers of their trees to fuel the furnaces needed for Saruman's arming of his dark army. The Ents then lead the entire forest toward Isengard. Aragorn, Gimli and Legolas then go into Fangorn and surmise that the forest feels as if it is about to explode. Shortly afterward, the three meet Gandalf (again, they at first take him to be Saruman), whom they believed had perished in the mines of Moria. He tells them of his fall into the abyss, his battle to the death with the Balrog and his resurrection and his enhanced power. Gandalf tells them that Merry and Pippin are safe, and then summarizes the situation. Their allies, Rohan and Gondor, lie in between Mordor and Isengard and that the treachery of Saruman diverts Rohan's forces from Minas Tirith. The four then ride to Rohan's capital, Edoras, where Gandalf rouses King Théoden from bewitchment and inaction against the threat Saruman poses. In the process, Saruman's spy in Rohan (and King Théoden's trusted advisor) Gríma Wormtongue, is expelled from Rohan. Éomer, imprisoned by Wormtongue, is released and named heir to the king since Théoden's son Théodred was slain in battle. Aragorn, Gimli, and Legolas then travel with Théoden's troops towards the fords of Isen, but they meet those who had retreated from the fords as they battled the Uruk-hai. Gandalf then tells them to ride to the fortress of the Hornburg, in the valley of Helm's Deep. Gandalf rides away before the battle begins, though he gives no reason for doing so. At the Hornburg, the army of Rohan led by King Théoden and Aragorn resist a full-scale onslaught by the hosts of Saruman. They are able to weather several assaults until things begin to go ill with Rohan. The wall of the Hornburg is taken, driving Éomer and Gimli into the Glittering Caves and Aragorn and Théoden into the citadel. Trapped and outnumbered, Théoden and Aragorn marshal enough riders to ride out in a final blaze of glory but are saved by the arrival of Gandalf and Erkenbrand, leading what remained of the army of Westfold after being routed by Saruman. The tide now turns in Rohan's favour, and Saruman's orcs flee into a forest of Huorns, creatures similar to Ents, and none escape alive. Háma, captain of the king's guard, had died during the attack. Gandalf, Aragorn, Gimli, and Legolas, along with King Théoden, Éomer, and the men from Rohan, head to Saruman's stronghold of Isengard. When they come to the Isen River, they find that the river is dry and that steams are coming up from the Wizard's Vale. When they reach Isengard, they discover that it is completely flooded and the central tower of Orthanc besieged by the Ents, with Saruman and Wormtongue trapped inside. Aragorn, Legolas, and Gimli reunite with Merry and Pippin and catch each other up on their various fortunes and what happened in Isengard. The hobbits tell the tale of how the Ents nearly caught Saruman after the Uruk-hai marched out to Rohan. The Huorns followed the Uruk-hai, but the Ents attacked Isengard, only to be foiled by the magic of Orthanc and the fire of Saruman's machinery. The Ents then flooded Isengard by damming and diverting the Isen. Gandalf and the entire company then go to Orthanc. Théoden rejects Saruman's offer of peace despite the wizard's cunning words. Gandalf then offers Saruman a chance to repent, but Saruman is too proud and refuses. So Gandalf casts Saruman out of the Order of Wizards and the White Council and breaks his staff. Gríma throws something from a window at Gandalf but misses, and it is picked up by Pippin. Gandalf quickly takes it from Pippin. This object turns out to be one of the palantíri (seeing-stones). Pippin, unable to resist the urge, looks into it and encounters the Eye of Sauron, but emerges unscathed from the ordeal. Gandalf then realizes at last the link between Isengard and Mordor and how Saruman fell at last into evil. By looking into the palantír, Saruman became ensnared by the Dark Lord and made to do Sauron's bidding. Gandalf then gives the palantír to Aragorn. Believing Saruman to have captured the Ringbearer, Sauron has sent a Nazgûl to Orthanc. When it passes overhead, Gandalf realizes that the Nazgûl's crossing of the River means that war is imminent. Gandalf takes Pippin then heads for Minas Tirith in Gondor in preparation for the war against Mordor, while Théoden, Merry, Aragorn, Gimli, and Legolas remain behind to begin the muster of Rohan, to ride to the aid of Gondor. Frodo and Sam discover and capture Gollum, who has been stalking them in their quest to reach Mount Doom and destroy the One Ring, as Gollum attempts to reclaim the Ring for himself. Sam loathes and distrusts him, but Frodo pities the poor creature. Gollum promises by the Ring (his "Precious") to lead the pair to the Black Gate of Mordor, and for a time appears to be like his old self, Sméagol. He leads them through a hidden passage of the Dead Marshes in order to avoid being spied by Orcs. Frodo and Sam learn that the Dead Marshes were once part of an ancient battlefield, upon which the War of the Last Alliance was fought. They see many dead faces of ancient warriors and orcs staring up at them. After the marshes, they then cross the desolation and come to the Black Gate. At night, Sam overhears Gollum talking to himself and plotting to get the Ring back. Unable to do so because of the promise he made to Frodo, he resolves to allow something he refers to only as "She" to take care of his problem. Sam realizes that the Ring masters Gollum more than hunger. Gollum persuades Frodo and Sam not to enter the Black Gate, where they would have been surely caught. Gollum tells them of a secret entrance to Mordor. Thus, they head south into Gondor's province of Ithilien, where they get to see one of the "oliphants" in a battle between the men of Gondor and the Haradrim. They are then discovered by a group of Gondorian rangers led by Faramir, the brother of Boromir. Frodo learns from Faramir of Boromir's death. Faramir and the Rangers lead Frodo and Sam into a secret hideout where Sam accidentally reveals to Faramir that Frodo carries the One Ring. As a result of this, Frodo reveals the plan to destroy the Ring in the fires of Mount Doom. Unlike his brother Boromir, Faramir resists the temptation of the Ring. Later that night, Gollum is captured diving for fish into the sacred pool. Frodo negotiates Gollum's freedom with Faramir. The following morning Faramir allows them to go on their way, but warns them that Gollum may know more about the secret entrance than he has been telling them. Gollum then leads the hobbits to the Cross Roads where they see a vandalized statue of a king of Gondor. They then reach the evil city of Minas Morgul, and Frodo watches as the Witch-king leads the Morgul army out and toward Minas Tirith. They then climb up a long, steep staircase of the Cirith Ungol and into a tunnel when Gollum disappears. The tunnel is actually the lair of an enormous spider named Shelob. Gollum hopes to get the Ring from Frodo's bones after Shelob is done with him. The hobbits escape Shelob in her lair using the light of the Phial of Galadriel and mistakenly assume that they are safe. However, Shelob sneaks up on Frodo. Sam attempts to warn Frodo but is attacked by Gollum. Shelob stings Frodo in the back of the neck and he collapses to the ground. Sam fends off Gollum, who runs off back towards Shelob's cave. Sam then fights Shelob, and eventually drives her off by wounding her with Frodo's blade, Sting and the Phial. After seeing Frodo lifeless and pale, Sam assumes that Frodo is dead and debates chasing Gollum and abandoning the Quest in favour of vengeance. Sam resolves to finish the Quest himself and takes the Ring, but when Orcs take Frodo's body, Sam follows them, aided by the invisibility of wearing the Ring. He learns that Frodo is not dead, but only unconscious, and is now a prisoner. Sam falls into a swoon as the orcs reach the undergate of the Tower of Cirith Ungol. The book ends with the line, "Frodo was alive but taken by the Enemy." The New York Times gave a positive review, calling it "an extraordinary work – pure excitement, unencumbered narrative, moral warmth, barefaced rejoicing in beauty, but excitement most of all." Anthony Boucher, although noting that The Two Towers "makes inordinate demands upon the patience of its readers" with passages which "could be lopped away without affecting form or content", nevertheless lavished praise on the volume, saying "no writer save E. R. Eddison has ever so satisfactorily and compellingly created his own mythology and made it come vividly alive ... described in some of the most sheerly beautiful prose that this harsh decade has seen in print." Some of the events of The Two Towers along with The Fellowship of Ring were depicted in the 1978 film of J.R.R. Tolkien's The Lord of the Rings, directed by Ralph Bakshi. In 1999, the Lifeline Theatre in Chicago presented the world première of The Two Towers, adapted for the stage by James Sie and Karen Tarjan, directed by Ned Mochel. "The World is changing. Who now has the strength to stand against the armies of Isengard and Mordor? To stand against the might of Sauron and Saruman ... and the union of the two towers? Together, my Lord Sauron ... we shall rule this Middle-earth." Both The Two Towers and the succeeding film, The Lord of the Rings: The Return of the King, abandoned the parallel storytelling of the volume in favour of a more chronological presentation. The first chapter from the volume actually appears at the end of Jackson's The Lord of the Rings: The Fellowship of the Ring. Later events of The Two Towers involving Frodo and Sam were filmed for Jackson's The Return of the King. Other significant changes were made in the plot line, partially to give each of the characters a story arc in which they could develop and change. Although all three of Jackson's films differ from their source material, The Lord of the Rings: The Two Towers arguably contains the most major alterations. Various games also adapt The Two Towers, including online role-playing games like The Two Towers Mud and graphically oriented console games. Perrott's Folly and the Edgbaston Waterworks chimney in Birmingham may have provided the inspiration for Minas Tirith and Minas Morgul. ^ "The Two Towers". Between the Covers. Retrieved 28 December 2010. ^ "The second part is called The Two Towers, since the events recounted in it are dominated by Orthanc, ..., and the fortress of Minas Morgul..."
^ Barr, Donald (1 May 1955). "Shadowy World of Men and Hobbits". The New York Times. Retrieved 28 December 2010. ^ "Recommended Reading", F&SF, August 1955, p.93. ^ "J. R. R. Tolkien". Government of the United Kingdom. 31 May 2007. Archived from the original on 7 June 2007. Retrieved 26 August 2007. ^ "Myths and Legends, Talking Tolkien". BBC. Retrieved 28 January 2012.